Although the Moselle river is particularly famous for its Luxembourg-German section where it passes through a beautiful wine-growing region, its source is in the Southern Vosges, and about 300 km of its course is in Lorraine. In Remiremont, an important town south of the regional capital of Epinal, the "real" Moselle is formed by the confluence of two small mountain rivers: the (very) Upper Moselle from Bussang and the Moselotte ("small Moselle") from Cornimont. Both of these mountain valleys were once opened up by branch railway lines. From the 1840's onward, there were plans to link the industrial Upper Alsace, with Mulhouse as capital and centre of textile industry, with the harbours of Northern France by means of a direct railway line running through Nancy, Epinal, the Upper Moselle valley, through the Vosges mountains under the Bussang pass and the Thur valley. Trains arrived at Epinal in 1857 and at Remiremont in 1864, this line being operated by the company Est. But when in 1870 a concession was given for the extension to Alsace, the war between France and Prussia began and ultimately lead to the integration of Alsace into the German empire; therefore, the main-line project was temporarily dropped. Instead of that, local railway companies were formed which opened branch lines up the two valleys: in 1879 both the Moselotte line Remiremont - Cornimont (24 km) and the Upper Moselle line Remiremont - Saint-Maurice (29 km) opened. There was resistance by the French armed forces to allow for the 4-km extension of the Moselle line up to Bussang, as this town was only 6 km away from the then German-French border, so the Bussang population had to wait until 1891 to get "their" station, which due to the time elapsed was built in a completely different and more beautiful style than the other (rather spartan) station buildings on the Moselle and Moselotte branches. 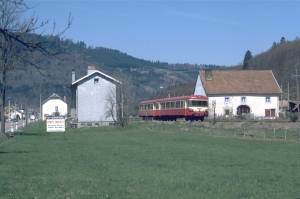 The Moselle line - as well as the Moselotte branch - remained in service as local branch lines. There were normally four or five pairs of trains on either branch, some of them replaced by buses on Sundays during the last years of operation. These trains were then all operated by EAD "caravelle" railcars. According to the timetable, there were Epinal - Bussang through trains, with connecting Remiremont - Cornimont services, but quite frequently the Cornimont unit and the Bussang unit were attached to each other between Epinal and Remiremont. Unfortunately, in the 1980's, when a new convention on regional train services was established between SNCF and the Lorraine region, the latter decided to concentrate improvement efforts on the rail service on the Nancy - Epinal - Remiremont main line and to replace trains on the Moselle and Moselotte branches by buses. 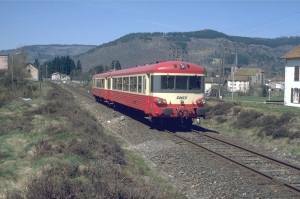 Thus the last passenger trains to Cornimont and Bussang ran on May 28th 1989. Freight traffic was by that time insignificant on the Moselle line, so that tracks were finally lifted in 1994. 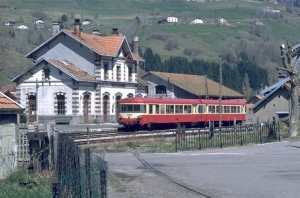 One has to admit that the Moselotte branch to Cornimont suffered from the handicap not to reach La Bresse, which is an important holiday and skiing resort and tourist centre, so that the replacement of trains by buses actually somehow improved convenience of transport for many passengers. This, however, is less clear for the Moselle line, which served all the towns and villages in the valley and even did so in a very efficient way, because stations were well located and mostly near the urban centres. The line passed through wonderful pastoral scenery, with the famous "ligne bleue des Vosges" (rising up to 1247 m above sea level at the Ballon d'Alsace, just south of Saint-Maurice) always in the background. Taking into consideration the scenic beauty of the valley and its potential for tourism, one can only regret the short-sighted decision by SNCF and regional authorities to stop train service and to lift the track. There would certainly have been a lot of possibilities to develop the line, but as French State Railways and French politicians are - generally speaking - indifferent to such development and lack both commercial imagination and entrepreneurial daring, the case of the Moselle line's decay is far from being exceptional. It is not hard to imagine what a regional railway company (like those of Switzerland or those formed in Germany since liberalisation in the railway sector has taken place), with the support of local municipalities and administrations, could have achieved with the Moselle branch's infrastructure. But now let us look at a more encouraging example of branch line development, i.e. at the Munster valley line. This is a page of the PictuRail web project. If you have comments please contact Claus D. Pusch. This page's contents are strictly copyrighted, but may be used with and linked to NON-COMMERCIAL railway-related web sites.